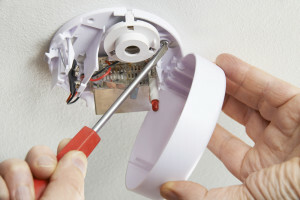 ﻿﻿ Fire Alarm Installations - APR Electrical Solutions. A high quality fire alarm is an essential investment for any home or workplace. We can supply and fit a variety of different fire alarms. We fit fire alarms at residential properties and commercial premises and our team have extensive experience of completing alarm installations quickly and efficiently. Our team will be happy to help you to choose the right alarm for your property so if you are unsure which system would be best for your building, we can help to ensure that you invest in the right alarm for your individual needs.